The 2010 edition of the Terracotta Festival closed with Teddy Chen’s Bodyguards and Assassins, a spectacular action saga set in Hong Kong in 1905, as historical revolutionary Dr Sun Yat-sen travels to the then British colony to meet with rebel leaders from other Chinese provinces and coordinate the uprising against the Ching dynasty. But the imperial regime has sent assassins to stop him and revolutionary Chen Shaobai puts together a team of ill-assorted and unprepared fighters to protect Dr Sun, with the help of businessman Li Yutang and his son Li Chongguang. Mixing fact and fiction, the film was a hugely ambitious and expensive project, not least because an entire Hong Kong neighbourhood had to be recreated full scale. Produced by Peter Chan, it was plagued by many problems, including death, financial difficulties and the SARS epidemic and took 10 years to make, a process documented in Hiroshi Fuzakawa’s Development Hell (2009), also presented at the festival. To find out more about the film, Virginie Sélavy talked to Teddy Chen during the Terracotta Festival in London. VS: You set the story of Bodyguards and Assassins against the background of historical events, namely the revolution led by Sun Yat-sen against the imperial regime of the Ching dynasty. Why did you choose that period of history? TC: Actually, the film was inspired by a film made by Peter Chan’s father in 1973 [Tung Man Chan’s The Bodyguard]. I started working on this film with Peter 10 years ago. I wanted to mix action with a bigger historical background to make an epic film. It sounded more interesting to me because all my previous films were made up – Purple Storm, The Accidental Spy, they’re not real. I thought about a subject for a long time, but nothing came to me. But then Peter said, ‘I’ll show you a video, it’s about a film that my father made, it’s about protecting Dr Sun’. When I heard this, I knew that was it. Dr Sun was kidnapped in London once and was almost killed in San Francisco by assassins, so I thought this great revolution father could be the background of the story. So it’s not because of the historical period, it’s because of the person. You focus more on the fictional, unknown characters who helped protect Dr Sun during a visit to Hong Kong, rather than on Dr Sun himself. Why is that? It’s a human drama. I want all those unsung heroes to move you for different reasons. Some of them don’t even know who the revolution father is, or what the revolution is for. They have their own reasons – they want to prove themselves, they want to die to serve a great cause, or they do it for the next generation, or out of friendship, or for the person they love. Many people have made films like this before, so I wanted to shoot it in a different way and I wanted to focus on why people become unsung heroes. The film opens with a teacher explaining the idea of democracy to his students before he is assassinated. The message seems to be that you have to make sacrifices to bring about democracy, is that something you believe? Yes, I totally believe that. We know the names of the famous heroes in every revolution, but there are many more unknown heroes to make the revolution a success. It took over 11 years, place after place in China. The main point I want to make is that there are heroes with no names. Can the film be taken as a comment on the current situation in China and the desire for more democracy? Nothing to do with that. Did you have any problems with the censors in China because of the subject matter of the film? Five years ago, when we started shooting the film, we had some problems because they had a department called the ‘History Department’ and if my movie had to go through that, I wouldn’t have been able to make it. But now, it’s more open in China, there’s less censorship. The authorities have now recognised that Dr Sun Yat-sen is a revolutionary father. Now there’s a picture of him in the People’s Square – there are five pictures, and one of them is of him. So they think it’s a good film to remind people to love their country. What was their problem with the film before? They said I was making up history, that this never happened in Hong Kong in 1905. But now they’re more open, they say ‘OK, it’s a made-up story, but the idea is right’, so they allowed me to make the film. There didn’t even make one cut. Did you worry that audiences and critics might expect an accurate historical account? Before we started I was a bit worried. But I think that as long as you fall in love with one of the characters, you will accept the whole story. I try to move the audience – if it works, they don’t care. The film shows the role that Hong Kong played in the revolution, due to the fact that it was a British colony. Was that an important part of the story for you? Yes, very important. I wanted to show the attitude of the British. They were not afraid, they didn’t want to be the enemies of the Ching dynasty, but they thought Dr Sun was doing the right thing, so they were in the middle and they said to him, ‘you can come but don’t make problems’. In fact, before 1905 Dr Sun Yat-sen was not allowed to come to Hong Kong because they didn’t want to make the Ching dynasty angry, but after five years the ban was lifted and he was allowed to come. So he really did come to Hong Kong on that day. Some say he didn’t come to the shore, he met people on the boat, but others say that he did, for a few hours. So there are several versions of the history. No one really knows what happened. How did you recreate Hong Kong in that period? When we first started we brought the crew, the art designers, etc, and they did some research, but then production stopped and we had to wait year after year. So at first we had a hundred pictures, but after all those years we had thousands, we had lots of research to support the film! Something very touching happened. I’m a Buddhist, I have a master, and he came to visit our set so at lunch time I showed him around. We went to one street and he stared at a staircase leading to the second floor of a building and he said, ‘do you know what was there 80 years ago?’ I said I didn’t. He said, ‘it was a tailor who worked there’. I said, ‘how do you know that?’ He said, ‘it was my father’s shop’. And it was exactly the same. I was so moved. We’d built it exactly as it was. We reconstructed everything according to the pictures. When the film starts, you really go back to 1905. How important is it to you that Western audiences understand the historical background? It’s not a documentary, it’s a drama! You don’t need to know what is real or not. As long as you go along with the characters, you will follow the story. How did you create the different characters of the bodyguards? It’s kind of a calculation. If they were all doing it for the revolution, for the same reason, I don’t think the audience would love every single character. But if they have different reasons, you might fall in love with one of them and you might like the other ones and follow the story. I want to make an action film that women also love because it’s a touching story. Until a few years ago, action films were men’s films, but if women love it, it’s not because of the action, the action just supports the film, it’s because of the characters and the emotions. The scene where the push-chair containing Li Chongguang rolls backwards down the stairs, chased by the chief of the imperial soldiers, reminded me of the famous scene of the Odessa steps in Battleship Potemkin, which also shows revolutionaries rising against imperial power. Was it a conscious reference? It did inspire us. 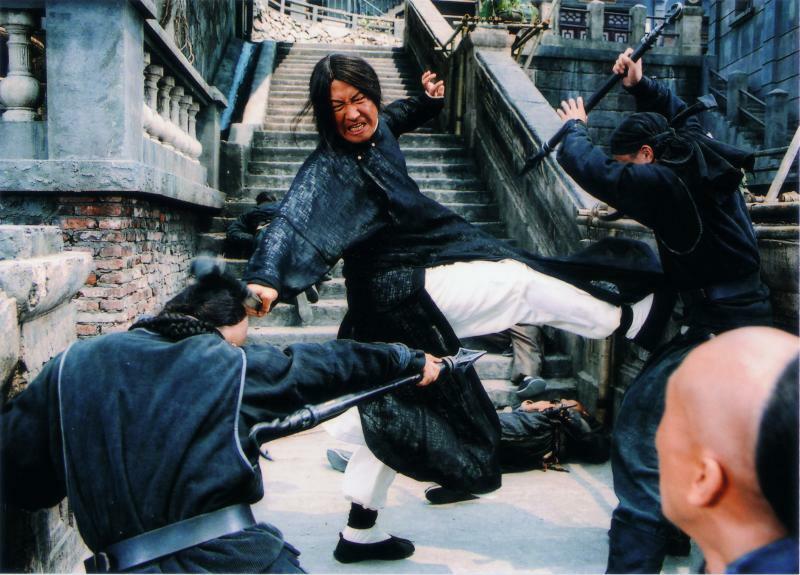 But it is a mainstream action film, a traditional Hong Kong film, so it should have a fighting scene at the end. At the same time, it is a kind of tragedy, so many people have risked their lives, and the young boy is last. But you don’t have to try and sustain the action, you have to let people think, it’s not just an action film. So that’s when we brought in the scene you mentioned. The staircase was good for us. We spent a lot of money building it, it’s a very iconic place in Hong Kong. The rickshaw is also famous in Hong Kong. We used the staircase to extend the time to let the audience think about what the point of the film is. The very last shot of the film is Dr Sun’s face on the boat back to China. Why did you choose to end on that image? A lot of people said, ‘Why did he come? So many people got killed’. But Hong Kong was the only place where he could go and meet the other revolutionaries because it was a British colony and the Ching dynasty couldn’t do much about it. That’s why I wanted people to realise that this man knew that people would have to be sacrificed but still he had to come. Revolution is sacrifice, you have to think big, you can’t stop.